University of Toronto Press, 9781487523695, 160pp. Celebrated as a novelist and made famous by her novel　Anne of Green Gables　and its sequels, L.M. 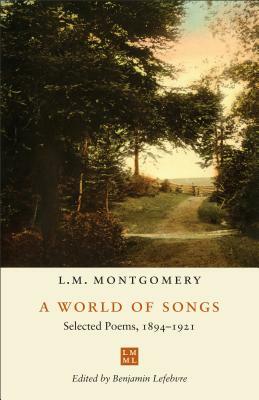 Montgomery (1874-1942) is far less known for also writing and publishing hundreds of poems over a period of half a century.Although this output included a chapbook and a full-length collection in which she presented herself primarily as a nature poet, most of her poems appeared in periodicals, including women's magazines, farm papers, faith-based periodicals, daily and weekly newspapers, and magazines for children. As a shrewd businesswoman, she learned to find the balance between literary quality and commercial saleability and continued to publish poetry even though it paid less than short fiction. A World of Songs: Selected Poems, 1894-1921, the second volume in The L.M. Montgomery Library, gathers a selection of fifty poems originally published across a twenty-five-year period. Benjamin Lefebvre organizes this work within the context of Montgomery's life and career, claiming her not only as a nature poet but also as the author of a wider range of "songs": of place, of memory, of lamentation, of war, of land and sea, of death, and of love. Many of these poems echo motifs that readers of Montgomery's novels will recognize, and many more explore surprising perspectives through the use of male speakers. These poems offer today's readers a new facet of the career of Canada's most enduringly popular author.